Public servants have, for the first time, joined their private sector counterparts at an intensive program for emerging women leaders, honing their leadership skills to contribute to a more inclusive Papua New Guinea. The Pacific Leadership and Governance Precinct has supported eight women to participate in the Business Coalition for Women’s Certificate IV in Leadership and Management, which is designed to prepare high-potential employees for management roles. Lesieli Taviri, Chair of the Business Coalition for Women (BCFW), said involvement of women in any decision-making capacity across sectors and the community promotes more inclusive nation-building. “Higher levels of female participation are closely linked with improved organisational performance,” Ms Taviri said. Priscilla Mais is one of eight public servants working side-by-side with their private sector peers. 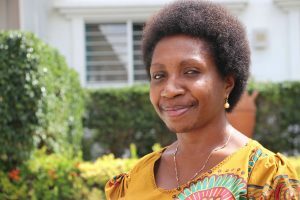 Priscilla Mais, Acting Executive Director at the Department of Education, was one of the public servants who commenced the Certificate in March and said the program has boosted her confidence and changed her approach to management. “I feel empowered and invigorated in my role as a manager, as a team player and as a public servant,” she said. Ms Mais has led the Department of Education’s Project Management Unit since it was established and wants to work with her team to come up with creative ideas on how to improve the Department, specifically in delivering school infrastructure. She said the training provided insights in to how small changes can make a large impact on professional and personal development. “This training has helped me to improve many things which I took for granted,” Ms Mais said. The Pacific Leadership and Governance Precinct is a partnership between Papua New Guinea and Australia that supports the development of ethical, capable public sector leaders. The Business Coalition for Women is a group of companies who are working together to drive positive change for women and businesses in Papua New Guinea.